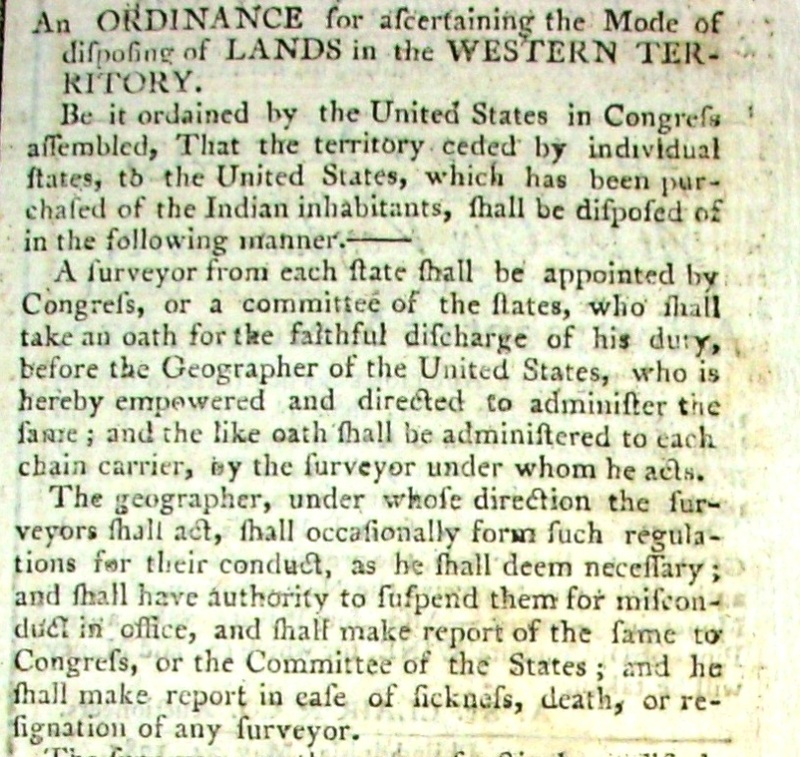 After ten years of hotly contested debates centering on state western land claims in the Continental Congress and United States in Congress Assembled (USCA), the time was right for the approval of an ordinance for governing the Northwest Territory. The treasury was utterly empty, the United States had defaulted on its loan payments to France opting to pay Holland or risk impressments of its ships. The States had relinquish their rights to a "test tract" of land and the USCA's Western Land Ordinance of 1785 was passed on May 20, 1785. 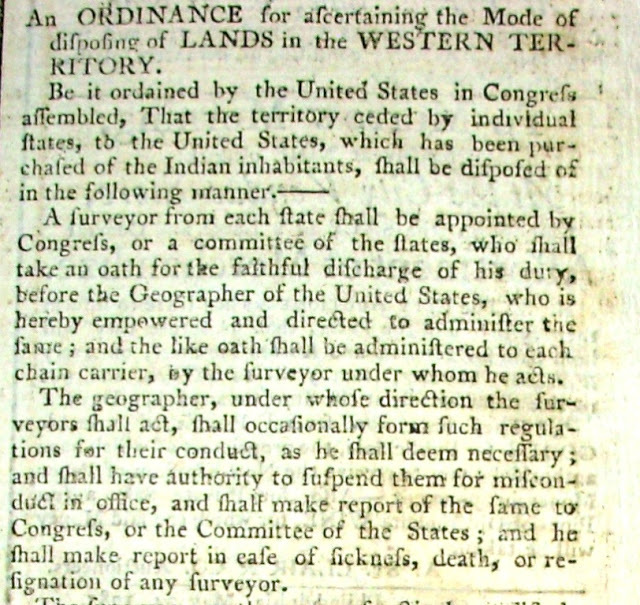 Exhibited is the Pennsylvania Packett and Daily Advertiser, Monday, May 30, 1785, full printing of the Western Land Ordinance dated May 20, 1785 and signed in type by Richard Henry Lee as President of the United States in Congress Assembled and Charles Thomson as Secretary of the United States in Congress Assembled. The Western Land Ordinance put the earlier 1784 Land Ordinance into operation by providing a mechanism for selling and settling the land. The federal surveyors divided the land into carefully planned individual square townships. Each side of the township square was to be six miles in length containing thirty-six square miles of territory. The township was then divided into one-square mile sections, with each section receiving its own number and encompassing 640 acres. Section sixteen was to be set aside for a public school and sections eight, eleven, twenty-six, and twenty-nine were to provide veterans of the American Revolution with land as payment for their service during the war thus greatly reducing the war debt. The government would then sell the remaining sections at public auction at the minimum bid of 640 dollars per section or one dollar for an acre of land in each section. The Federal Government under the Western Land Ordinance of 1785 lacked the resources to manage the newly surveyed Northwest Territorial lands because Native Americans refused to relinquish a large percentage of the plotted land and most of the territory remained too dangerous for settlement. This situation required either troops to eject the Native Americans or capital to purchase their land "fairly," insuring the peaceful sale and settlement. Additionally, the small amount of federal land that was not in dispute by the Native Americans was enthusiastically being occupied by western settlers who had no faith in or respect for the USCA operation as a federal authority. The settlers just claimed the land as squatters and the USCA was unable to muster the capital for magistrates let alone troops to enforce the $1.00 per acre fee required for a clear federal land title. With the States no longer in control of the lands and no federal magistrates or troops to enforce the laws, a tide of western squatters flowed into the Northwest Territory. Tract sales were meager and the plan of revenue flowing from the Northwest Territorial land sales became another liability. By 1787 the USCA was in the right frame of mind to consider plans for bringing the government lands into market because the Ohio Company was willing to purchase millions of acres for private development. Additionally, earlier in the month Delegate James Monroe’s committee on the western government proposed the replacement of Jefferson’s 1784 eleven states’ plan with a system that would result in no less than three or more than five states. Earlier that year, the Ohio Company replaced Parsons with the Reverend Manasseh Cutler aligned himself with William Duer,  secretary of the U.S. Treasury Board. Pressures on the U.S. Treasury were dire and Duer and his associates formed a steadfast group of New York speculators determined for the settlement of the Northwest Territory. It was the economic strain added to the influence of Duer and Massachusetts Delegate Nathan Dane  that persuaded President Arthur St. Clair and key delegates to permit Dr. Cutler  to work directly with the committee assigned the task of drafting the Northwest Ordinance. The Committee consisted of only Virginia Delegate Edward Carrington  and Massachusetts Delegate Nathan Dane because committee members James Madison and Rufus King were in Philadelphia at the Philadelphia Convention. In the afternoon, the USCA appointed three new members, former President Richard Henry Lee, John Kean,  and Melancton Smith  to replace the three absent delegates. The new delegates outnumbered the old delegates who had been working on the measure for over a year. Additionally, Carrington was elected as the Chairman and they with Ohio Company Agent Cutler took up James Monroe’s plan. This committee did not merely revise the ordinances of 1784 and 1785; they began to draft an entirely new plan for the territory northwest of the Ohio government. The committee, animated by the presence of Lee, went to its work in good earnest. Dane, who had been actively employed on the colonial government for more than a year, and for about ten months, had served on the committee which had the subject in charge, acted the part of scribe. Like Smith and Lee, he had opposed a federal convention for the reform of the constitution. The three agreed very well together, though Dane secretly harbored the wish of finding in the West an ally for " eastern politics." They were pressed for time, and found it necessary finally to adopt the best system they could get. 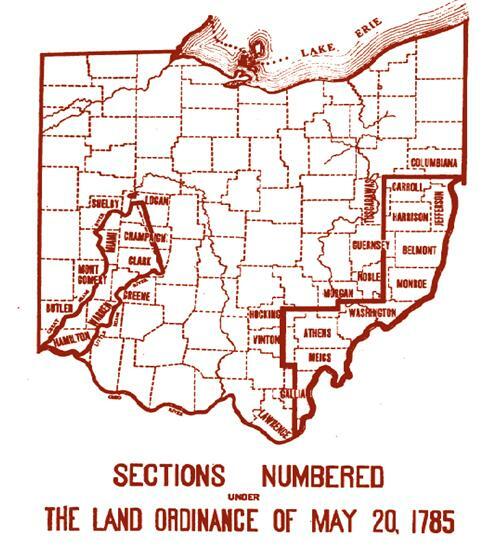 At first they took up the plan reported by Monroe; but new ideas were started; and they worked with so much industry that on the eleventh of July their report of an ordinance for the government of the territory of the United States north-west of the river Ohio was read for its first time in congress. 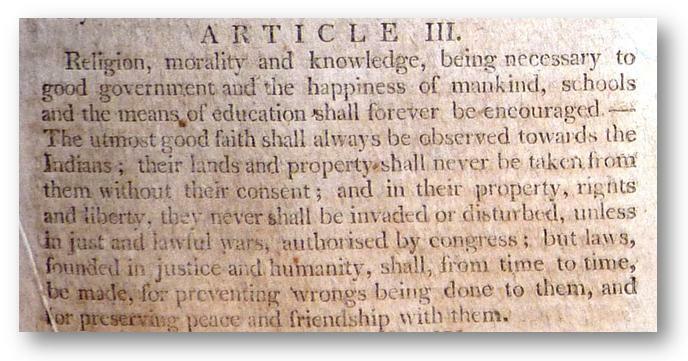 Cutler added an educational provision which was revised by the committee and became part of Article III. Other revisions were made after input from the President. Dr. Cutler, satisfied with the changes, did not remain in New York for the vote in Congress and left for Philadelphia that evening. The ordinance required seven votes to pass and the States were divided four South and five North. 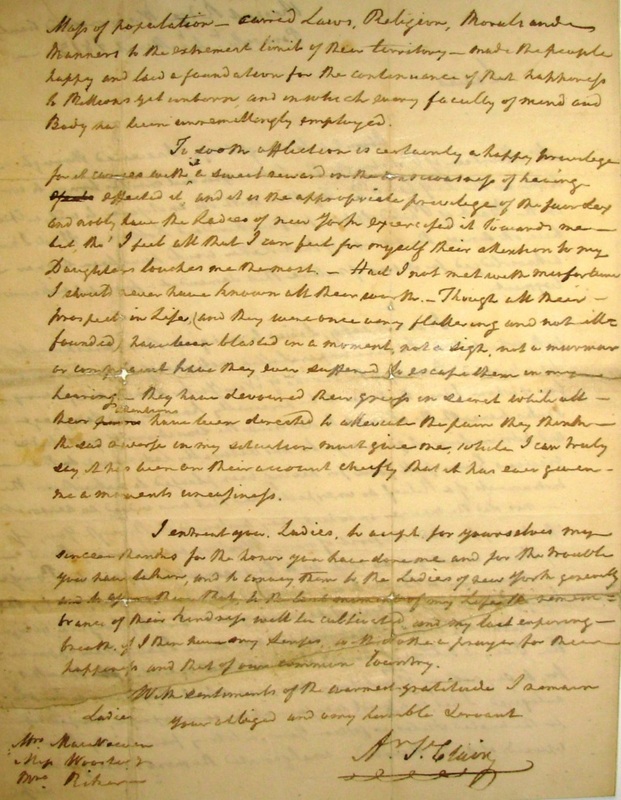 The reading by Chairman Nathan Dane on the 11th did not include the provision abolishing slavery. The Chairman who has been credited, along with Cutler, with the primary drafting of the ordinance thought it best to leave the anti-slavery language out. He and other anti-slavery delegates believed this would enable the southern delegations to focus more clearly on the favorable attributes of the ordinance. On July 12th, the ordinance was read again by Dane but this time the anti-slavery provision was added. In a strange twist of events on July 12th, as the all-important Northwest Ordinance bill was being debated on the floor, President St. Clair decided to take a three-day leave of Congress along with what surely would have been a yes vote from the Commonwealth of Pennsylvania. Eight states remained, evenly divided and neither the President nor the Ohio Company was present to effectuate the required seven state passage of the ordinance. On July 13th to Dane’s surprise, the ordinance passed unanimously. On the 13th of July he [President Arthur St. Clair] did not preside. He had gone the day before to New Jersey to visit a friend, and he did not return until two days after the passage of the Ordinance. Only eight States out of thirteen voted for that instrument: Pennsylvania was one of the five not represented. When St. Clair returned to New York, he was accompanied by General Irvine, one of his colleagues. In a letter of the latter, written 19th July, and addressed to Colonel Richard Butler, he refers to the Ordinance which had passed two days before his return, and adds: "Who the officers of that government will be I have not heard, nor inquired." If the name of General St. Clair had been canvassed, or, if he had had any understanding with the New England people, as is alleged, it would have been known to a friend as intimate as General Irvine. But, furthermore, we have his own testimony, which is of the best, to sustain us. In a letter to the Hon. William B. Giles, he says that the office of Governor was, in a great measure, forced upon him by his friends, who thought there would be in it means to compensate for his sacrifices to his country, and provide for his large family. But it proved otherwise. He had "neither the taste nor genius for speculation in land; nor did he consider it consistent with the office." He declared the accepting of the Governorship the most imprudent act of his life, for he was then in possession of a lucrative office, and his influence at home was very considerable. But he had the "laudable ambition of becoming the father of a country, and laying the foundation for the happiness of millions then unborn." 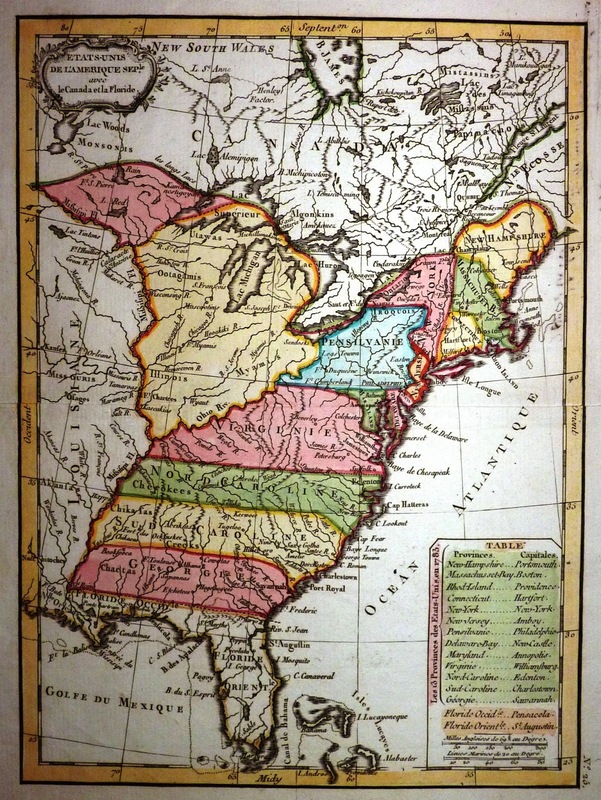 TREATY OF PARIS 1783 MAP entitled ETATS UNIS DE L'AMERIQUE SEPTENTRIONALE avec le Canada et la Floride, by Jean Lattre, is on exhibit with the Northwest Ordinance. 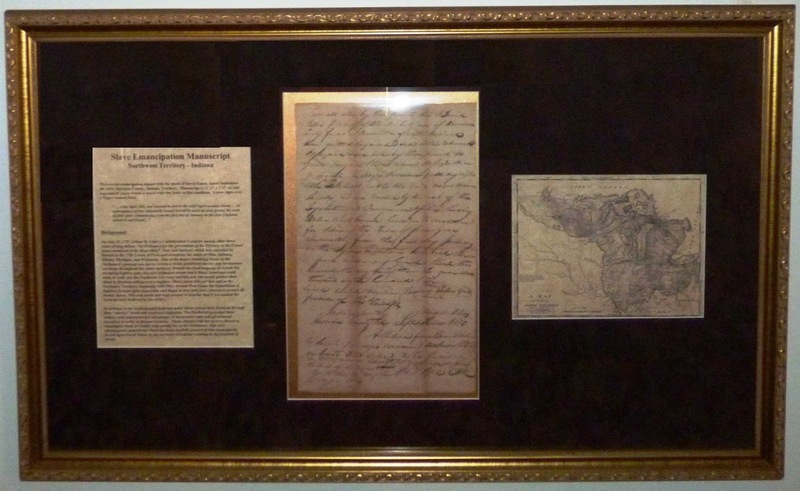 This 18th century copperplate engraved map was dedicated and presented to his Excellence Mr. Benjamin Franklin, Minister Plenipotentiary of the United States of America at the Court of France. 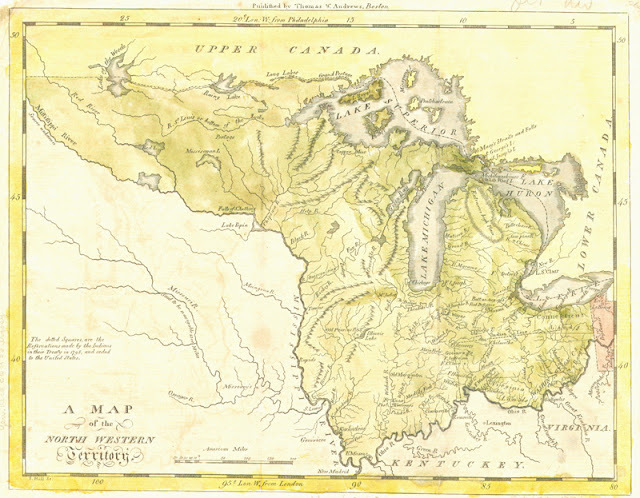 The map clearly shows the States' land claim challenges to the Northwest Territory that were still hotly debated in Congress. - Loan Courtesy of Klos Yavneh Academy Collection. We have been much engaged in business for ten or twelve days past for a part of which we have had eight States. There appears to be a disposition to do business, and the arrival of R. H. Lee is of considerable importance. I think his character serves, at least in some degree, to check the effects of the feeble habits and lax modes of thinking in some of his Countrymen. We have been employed about several objects; the principal ones of which have been the Government enclosed and the Ohio purchase. The former you will see is completed and the latter will be probably completed tomorrow. We tried one day to patch up M; Systems of W. Government; Started new Ideas and committed the whole to Carrington, Dane, R. H. Lee, Smith, & Kean; we met several times and at last agreed on some principles at least Lee, Smith & myself. We found ourselves rather pressed, the Ohio Company appeared to purchase a large tract of the federal lands, about 6 or 7 million of acres; and we wanted to abolish the old system and get a better one for the Government of the Country; and we finally found it necessary to adopt the best system we could get. 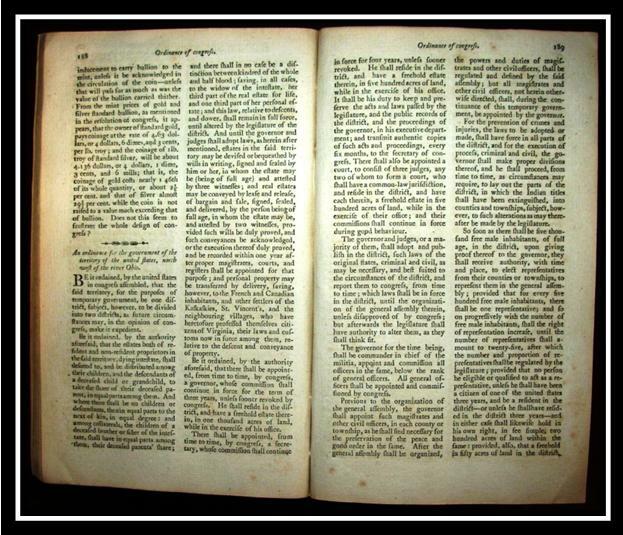 All agreed finally to the enclosed except A. Yates; he appeared in this Case, as in most other not to understand the subject at all. I think the number of free Inhabitants 60,000, which are requisite for the admission of a new State into the Confederacy is too small, but having divided the whole territory into three States, this number appeared to me to be less important, each State in the Common Course of things must become important soon after it shall have that number of Inhabitants. The eastern State of the three will probably be the first, and more important than the rest; and, will no doubt be settled chiefly by Eastern people, and there is, I think, full an equal chance of it adopting Eastern politics. When I drew the ordinance which passed (in a few words excepted) as I originally formed it, I had no idea the States would agree to the sixth Article prohibiting Slavery; as only Massa. of the Eastern States was present; and therefore omitted it in the draft; but finding the House favorably disposed on this subject, after we had completed the other parts I moved the article; which was agreed to without opposition. We are in a fair way to fix the terms of our Ohio sale, &c. We have been upon it three days steadily. The magnitude of the purchase makes us very cautious about the terms of it, and the security necessary to ensure the performance of them. The negotiations with the Ohio Company and their New York Associates syndicate later known as the Scioto Company was fruitful. Appointed superintendent of the Ohio Company, Putnam arrived at the confluence of the Muskingum and Ohio Rivers on 7 April 1788 with a company of men to found a settlement, subsequently named Marietta. While the work of surveying, clearing, and building went on, the company's directors attempted to raise the remaining $500,000 owed to the government. In October 1789 Richard Platt, a New York merchant and the company’s treasurer, reported that shareholders were almost $300,000 in arrears for their subscriptions of company stock, but had all of them paid up, the company still would have been short of the money that was owed. In addition, trouble with the Indians on the company's land meant the hiring of guards, the building of fortifications, and the curtailing of settlements. In 1790 Congress accepted a plan proposed by Alexander Hamilton, Secretary of the Treasury, to fund all outstanding federal and state debts, a plan that effectively raised the depreciated currency to par value. 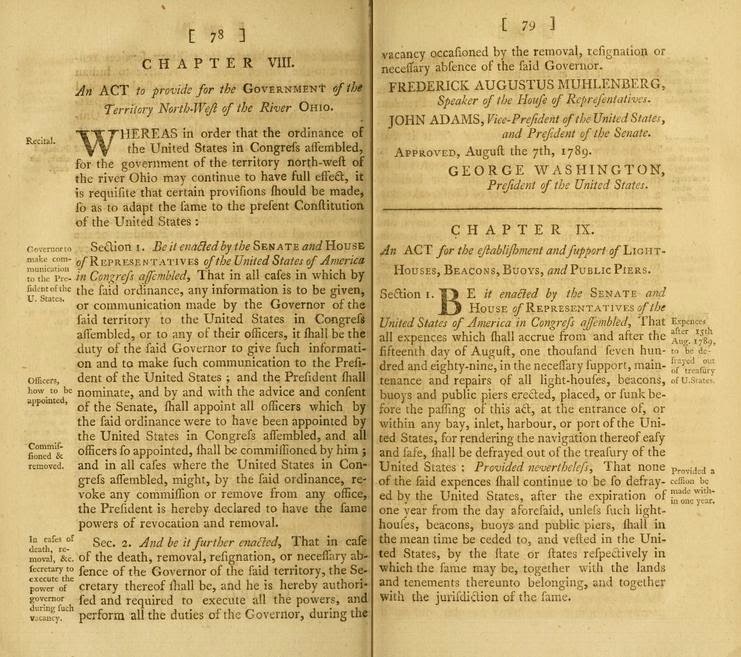 [NORTHWEST ORDINANCE] – Exhibited here is the full printing of “An ordinance for the government of the territory of the United States, north west of the river Ohio". 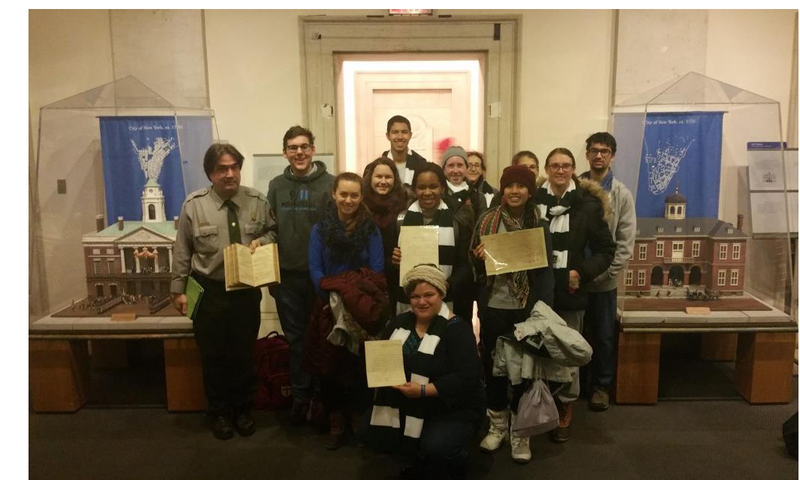 The American Museum, or Repository of Ancient and Modern Fugitive Pieces, &c. prose and poetical. For August, 1787. Volume II., Number II. 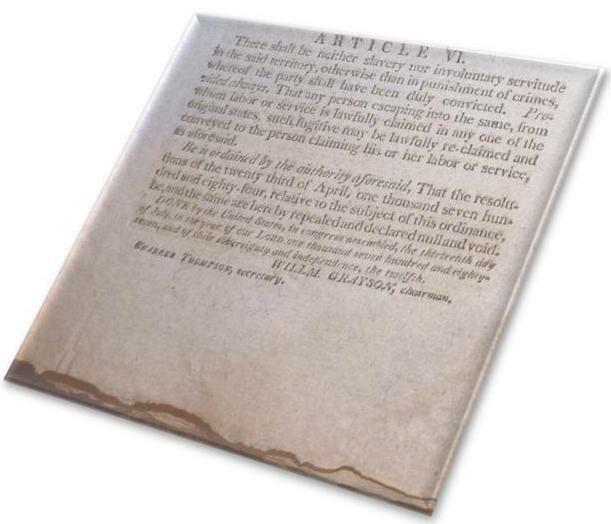 Philadelphia: Mathew Carey, 1787., This is the first US Magazine printing of the ordinance appearing in print only two weeks after it was enacted. 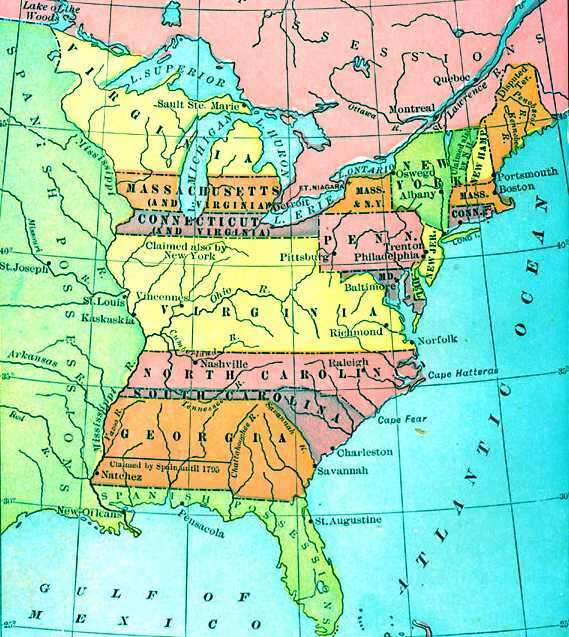 The "Northwest Ordinance", based on an area originally laid out in 1784 by USCA Delegate Thomas Jefferson in his "Report of Government for Western Lands", concerned the land north of the Ohio River, and east of the Mississippi (now the states of Ohio, Indiana, Illinois, Michigan and Wisconsin). It was one of the most significant achievements of the United States in Congress Assembled. In its six "Articles of Compact", largely written by Rufus King and Nathan Dane of Massachusetts, the ordinance contained provisions for the advancement of education through land grants, the maintenance of civil liberties and the exclusion of slavery. It provided a legal mechanism for citizens to formulate the state of Ohio in 1803 thus accelerating the westward expansion of the United States. The ordinance, in fact established the laws for the admission of all US states since 1787. Also in this August 1787 "the American Museum" are published "Resolutions of congress for the establishment of a new money of account for the united States. 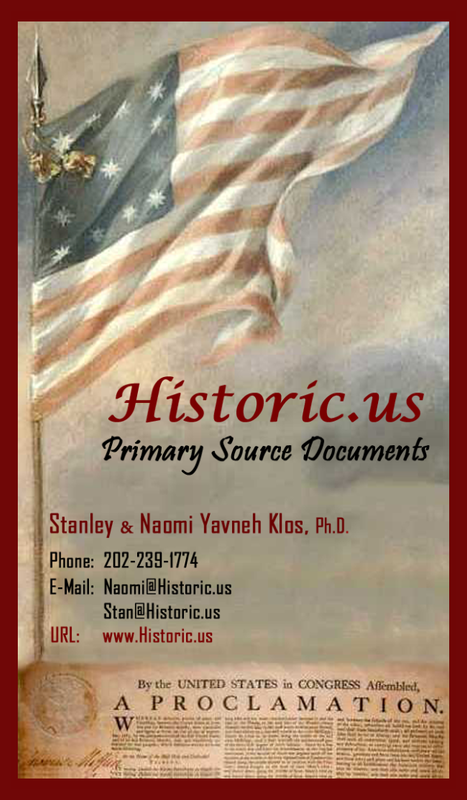 "; "An ordinance for the establishment of the mint of the united States of America; and for regulating the value and alloy of coin"; and a number of letters by scientist and politician Hugh Williamson (1735-1819) as "Sylvius", an ".effective analysis of the domestic economy, the federal debt, the problems of paper currency, the necessity for industrial development, and the need for an excise tax" - Loan Courtesy of KlosYavneh Academy Collection. We are accustomed to praise lawgivers of antiquity ... but I doubt whether one single law of any lawgiver, ancient or modern, has produced the effects of more distinct, marked, and lasting character than the Ordinance of 1787. Specifically, this ordinance was an exceptional piece of legislation because Article Five permitted the people North and West of the Ohio River to settle their land, form their own territorial government, and take their place as a full-fledged state, equal to the original 13. 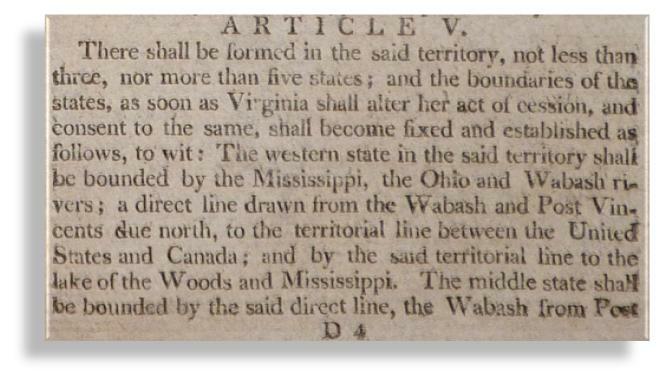 The Northwest Ordinance's Article Five became the principle that enabled the United States rapid westward expansion, which ended with the inclusion of Alaska and Hawaii as our 49th and 50th states. This ordinance also guaranteed that inhabitants of the Territory would have the same rights and privileges that citizens of the original 13 States enjoyed. Equally important, Article Six provided that slavery and involuntary servitude were outlawed in the Northwest Territory. 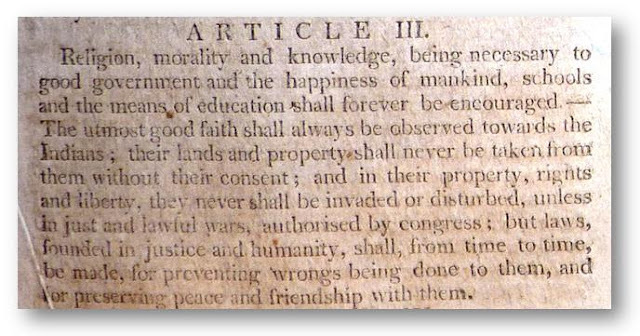 Article Six was the first federal law that finally gave some merit to "... all men are created equal...” written 11 years earlier in the Declaration of Independence. The Northwest Ordinance required Enlow to free Sarah and also forbade involuntary servitude. Whether's Sarah agreeing to "voluntarily bound herself to serve me and during the term of four years" as a condition of her freedom was legally enforceable is a matter of debate. Religion, Morality and knowledge being necessary to good government and the happiness of mankind, Schools and the means of education shall be forever encouraged. This measure essentially legislated that religion and morality were indispensable to good government but it was not carried out by the federal government because the United States confederation was financially insolvent in 1788 and faded away in 1789. A second constitution emerged from Philadelphia that laid the legal foundation that Jefferson would refer to as "thus building a wall of separation between Church & State.”  Several western state governments adopted similar legislation to Article Three and provided financial assistance to the churches up and until the early 19th Century. On August 7th, 1789, under the Constitution of 1787, An Act to provide for the Government of the Territory Northwest of the river Ohio passed by Congress was signed into law by President George Washington. This bill was the reenactment of the Northwest Ordinance passed by the USCA in July 1787 so that “… may continue to have full effect, it is requisite that certain provisions should be made, so as to adapt the same to the present Constitution of the United States.” Former USCA Governor Arthur St. Clair was re-appointed by President Washington and confirmed by the U.S. Senate. The law promising "The utmost good faith shall always be observed towards the Indians; their lands and property shall never be taken from them without their consent; and, in their property, rights, and liberty, they shall never be invaded or disturbed...", despite the Northwest Ordinance being re-enacted, were rendered meaningless when the US political situation changed with the release of Georgia's western lands and the acquisition of Louisiana territory in 1803. Native American sovereignty and the policy of peacefully mixing Indians and white settlements drastically change to relocating the eastern Indian tribes to the lands west of the Mississippi. Additionally, Georgia agreed to cede its western lands reaching to the Mississippi only after extracting a promise from federal officials to "peaceably obtain, on reasonable terms," the Indian title to all land within new Georgia state borders. In 1803, President Thomas Jefferson saw an opportunity to both appease Georgia and legitimize the controversial Louisiana Purchase by drafting a constitutional amendment authorizing Congress to exchange lands in the west for any and/or all eastern lands occupied by Indians. This constitutional amendment was never submitted because Congress authorized President Jefferson to administer an Indian removal and land exchange program that required Native Americans to sign relocation treaties that included allegiance to the United States. As Euro-Americans poured into the United States, the new citizens sought to move westward claiming Indian land for settlement all the way to the Pacific Ocean. The hundreds of sovereign Native American nations, including the relocated eastern tribes, refused to willingly or voluntarily give up their lands west of the Mississippi. Consequently, the United States government concocted and executed hundreds of one sided treaties with Indian nations that were legitimized by a series of US Supreme Court Decisions. Additionally, Congress passed hundreds of laws designed to redefine relations between the federal government and Indian nations. Article III of the Northwest Ordinance, within 40 years after its passage, was rendered impotent. Congress proceeded to the election of a governor for the western territory pursuant to the Ordinance of the 13th of July last and the ballots being taken the honorable Arthur St Clair was elected. Congress proceeded to the election of a secretary pursuant to the said Ordinance and the ballots being taken Mr. Winthrop Sargent was elected. On October 21st, the USCA approved the sale of over one million acres to the Ohio Company. Governor St. Clair was now responsible for governing, settling and subdividing the territory of what are now Ohio, Indiana, Illinois, Michigan, Wisconsin and Minnesota whose lands, at that time, comprised more than one half the geographic area of the United States of America. The President observing, in an address lately delivered by you to the convention held at Chillicothe, an intemperance and in decorum of language toward the Legislature of the United States, and a disorganizing spirit and tendency of very evil example, and grossly violating the rules of conduct enjoined by your public station, determine that your commission of Governor of the Northwestern Territory shall cease on the receipt of this notification. 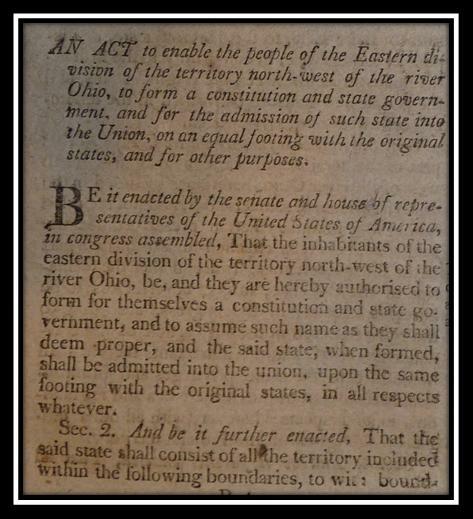 On February 19, 1803, the Republican United States Congress approved Ohio's constitution and admitted Ohio as the 17th state. Thomas Worthington was hailed as the hero of the Ohio Constitutional Convention and usurped forever the moniker: "The Father of Ohio's Statehood" its founder. Arthur St. Clair returned to his farm in Western Pennsylvania and resided there for 15 years with his wife Phoebe as a private citizen. … the venerable patriot, in his eighty- fourth year, undertook to go to Youngstown, three miles distant, for flour and other necessaries. He bade good-bye to his Louisa and started off with his pony and wagon, in good spirits. The authorities had changed the Stage road so that it passed along the Loyalhauna Creek, several miles north of the St. Clair residence, and the route to Youngstown was rough and dangerous. Pony and wagon moved safely along until within a mile of the village, when a wheel falling into a rut, the wagon was upset, and the aged General thrown with great force upon the rocky road. In the course of the day he was discovered lying where he had fallen, insensible, and the pony standing quietly at a short distance, awaiting the command of his old master — faithful to the last. He was carried tenderly back to the house, but neither medical skill nor the tender care of loved ones could restore him, and, on the thirty-first, Death came with his blessed message of peace forevermore. "... My Heart Is not yet so cold as to be insensible to female Praife (Praise) --- it conveyed a Balm to my wounded spirit. Wounded not by the loss of fortune and the need of pecuniary aid, but by confine obloquy and contumely whom I thought (and now since I have their approbation I say it boldly), I thought that I had least merited thanks, for to say nothing of my military services which they have so kindly eulogized. I had, in a great meafsive (massive) therefore at my own expense, raised up for the United States in fifteen years a colony from thirty men to upwards of sixty thousand ­-- amalgamation the most heterogeneous mafs -- Mafs of population --- carried Laws, Religion, Mounts and Manner to the extreme limits of New Territory --- made the people happy and laid a foundation for the continuance of the happinefs to millions yet unknown and in which every faculty of mind and Body has been overwhelmingly employed. 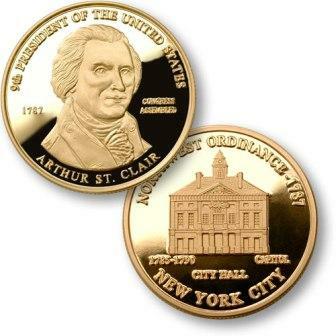 ... "
Several months later the legislature of Pennsylvania finally granted St. Clair an annuity of $8400, and shortly before his death he received from congress $2,000 in discharge of his claims, and a pension of $60 a month.